Camping is an exceptional way of getting away from the trials and tribulations of day to day life and creating a feeling of truly being at one with nature. The whole family can forget about work or school for a time and simply focus on enjoying the wonders of the great outdoors. Although camping is a form of escape and can provide the most wonderfully relaxing vacation, there are some important considerations which have to be made in advance in the likely absence of many home comforts. One of the potential difficulties likely to be encountered at camp is how to keep food fresh without a refrigerator or pantry. A big part of keeping food fresh while camping is in planning ahead. Careful thought should be given to not only which foods are to be taken to camp but how they are to be packaged prior to setting out from home. Canned foods are the obvious choice in this respect, as they can usually be stored very effectively at camp as they would be anywhere else, without the risk of spoiling. Packaged items such as cookies, potato chips or even dehydrated foodstuffs are an equally good choice. Although it would be entirely possible to survive at camp on packaged foods of this type, it may not prove to be the most enjoyable of trips. Fresh meat and dairy products, fresh fruit and vegetables and perhaps even fresh fish caught while at camp are all needed for a true culinary camping experience for many people. A small stream or river close to camp is an excellent resource for fashioning a makeshift refrigerator. A spot should be carefully selected where the current is not going to sweep anything downstream. A fairly shallow, natural inlet, which can perhaps be substantiated with rocks, is the ideal location. Food should be placed in a plastic container or cool box, which is then semi-submerged in the water and either tied, wedged or weighted in place. It is vital to remember, as at home, that raw meats should be very carefully separated from all other foodstuffs. Vacuum packing meats prior to leaving home, wrapping them substantially with plastic wrap, or including them in individual plastic boxes is essential. If practical, store them in a separate cool box as well. Foods which are not normally refrigerated such as certain fruits and vegetables should be kept cool and away from direct exposure to sunlight. If your tent has an awning, a simple bowl on a table would be perfect while you are close by. Alternatively, they can be kept in the tent, provided the tent remains well ventilated in the heat of what will hopefully be the daytime sun. The problem you are likely to encounter in this respect is local wildlife looking for food and care should be taken against scavengers at all times. It is important to check foods which are being kept at camp on a daily basis, even where they may not be required for immediate use. Water flow levels in rivers or streams may have changed and differing temperature levels may affect where fruit or vegetables should be stored. Provided proper thought is given to caring for food stored at camp and the required knowledge is applied, it is entirely possible to store most foodstuffs at camp for almost as long as they would be stored fresh at home. There are two principal cooking methods which can be employed at camp, the most traditional of which is cooking on an open fire. The first thing it is imperative to know about cooking food in this way at camp is that the food needs to be cooked on or above the hot embers of an established fire, rather than in the roaring flames of a newly built fire. Attempting to cook food on high flames will not only be extremely dangerous, it is likely to burn the outside of the food while the inside remains uncooked and even cold. This could affect not only the enjoyment of your food but could lead to food poisoning and have serious health implications. Just as at home, different types of food will take different lengths of time to cook on the fire. Potatoes are delicious cooked in the embers of a camp fire and aluminum foil is a wonderful modern day innovation in this respect. Wash but don’t peel your potatoes and wrap them individually in foil, shiny side of the foil innermost. Lay them in the burning embers of the fire for an hour to two hours, depending upon size, before scooping them out with a stick and very carefully unwrapping the foil. Test with a knife and if more cooking time is required, simply re-wrap and put them back in the fire. Sweet potatoes can also be cooked in this way, with the added benefit that they will take less time to cook. If your camping trip involves a spot of fishing, it is extremely likely that you will want to be cooking your catch. Fish such as trout, up to a couple of pounds, can very successfully be cooked in the embers of a camp fire using a simple, every day item: a newspaper, a supply of which may need to be brought from home. Gut your fish and wash out the body cavity but otherwise leave it intact. You may want to season the inside of the fish, or stuff it with some fresh herbs. Take one sheet from your newspaper and wet it. Careful not to tear the paper, use it to wrap the fish. Repeat this process, one sheet at a time, until the whole newspaper is wrapped around the fish. Place the parcel in the hot embers until the paper starts to go on fire. At this stage your fish should be cooked. Pull it from the embers with a stick and gently beat out any flames. Cut away the paper and enjoy. Meat can also be cooked in aluminum foil in the embers of the fire, just as it would be in a domestic oven. It is more fun, however, to cook anything from steaks to sausages on a wooden handled toasting fork. You can either take a toasting fork to camp, or fashion one by tying a metal fork securely to the end of a stick. Freezer bag ties are an excellent tool for this purpose, or any type of fine wire. If using twine, ensure it is kept well away from any naked flame and do not use any form of metal implement in lieu of a stick. Remember to hold your meat above the flames and not actually in them and toast until cooked. Marshmallows quickly toasted in this fashion make a perfect camping dessert. Dedicated camping stoves come in many shapes and forms. 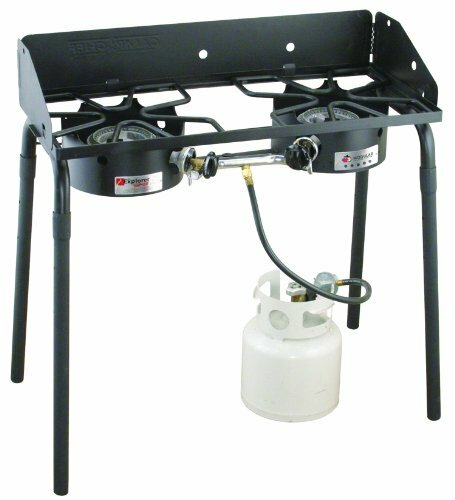 These gas powered stoves allow meals to be prepared in a similar fashion to how they would be cooked at home. In order to retain the camping spirit, however, you will want to cook traditional camping meals on your stove. This means one pot meals, such as the traditional sausages and beans. Be sure only in this type of cooking that the ingredients are added to the pan in order of length of cooking time. In the sausage and beans example, the sausages should be fully cooked before the beans are added simply to heat through. When you are eating at camp, the last thing you are likely to want to face at the end of your meal is a lot of washing up. A lot of camp food can be eaten simply with your fingers but certain items will require at the very least a knife, fork or spoon. Try investing before you go to camp in some inexpensive, disposable cutlery and plates and save yourself the pain after the pleasure, ensuring only that the items are later disposed of in a sensible and environmentally friendly fashion. Nice, thorough article, with some good tips. Camping season is just around the corner!